Custom Dorm Room Decorations: Door Signs, Removable Wall Decals and More! Going to college is one of the most exciting times of your life. You are moving out of your parent's house and into the dorms where you will meet lots of new people. One of the best parts about your new living space is that you get to decorate it how you want! There are lots of ways you can decorate your dorm room to make it unique. When you first move into the dorm, you might not know that many people. 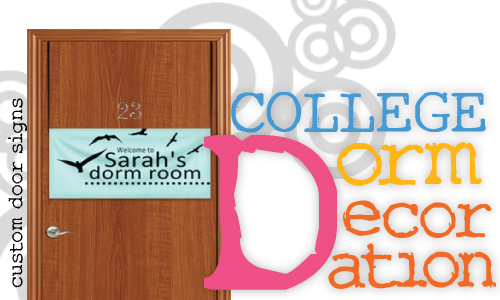 You can make a custom name sign like "Welcome to Sarah's Room" to put on your door to let people know who you are. In the dorms you won't be able to paint the walls, but you can customize the walls by making custom removable wall decorations! You can create anything from quotes to whole wall murals. The wall graphics are similar to a poster, but they have an adhesive backing. The best part is, the decals are removable so they won't harm the walls when it's time for you to move out. Another unique decoration is custom fabric banners. You can hang the fabric over the walls for a backdrop decoration. If you get the pole pocket option, you can use the fabric as a custom curtain. You can print any sort of design on the fabric to make your room unique. 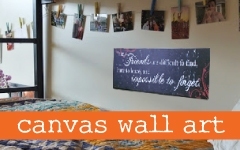 Canvas wall art can also be used to decorate your dorm room. You can make picture collages of your high school friends and your college friends. You can also have your favorite quote hanging up. To get started, visit our website, or contact a customer service representative at 320.965.9300.